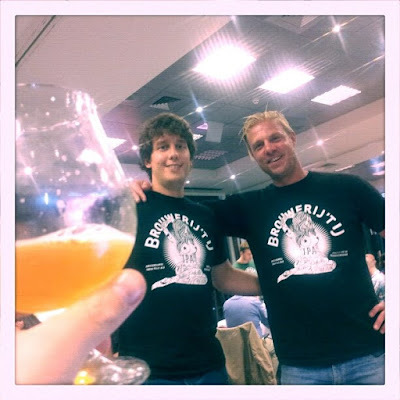 This was a live event, in which I and about 75 other beer bloggers and writers took part in live beer blogging from the European Beer Bloggers Conference in Amsterdam. I have tidied up a few grammatical errors and placed a couple of links I couldn't place at the time. Photographs were taken as I wrote but added later. 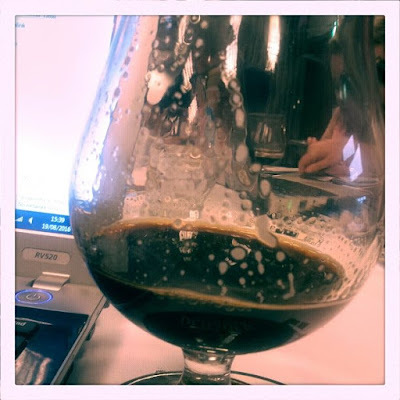 Kompaan Brewery, the second beer I encountered this morning, are first at our table. We're to have five minutes with each brewery, and there are ten in total. Caps are cracked on bottles of their double IPA, Handlanger. At 8.2% this beer's name translates to "accomplice"- a dangerous companion, the brewers say. It pours hazy and the colour of dry and dead grass, if grass could blush. This is a good thing. On the nose, bright and pointed fruit. Bitter orange rules over the taste. 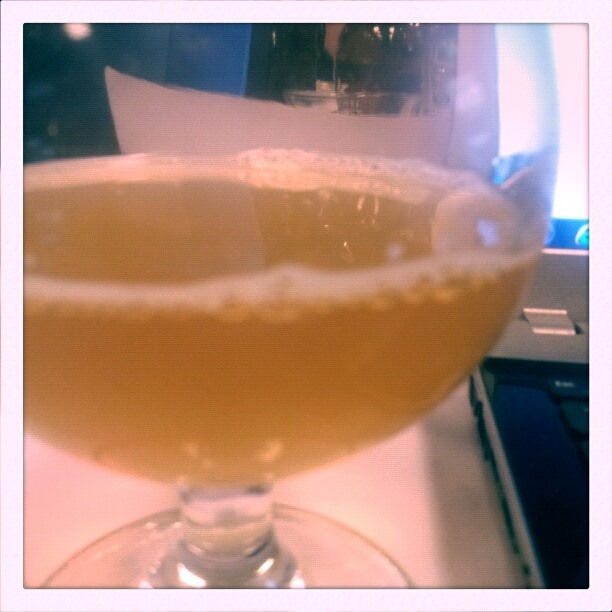 Oersoep Microbrewery are at our table now. 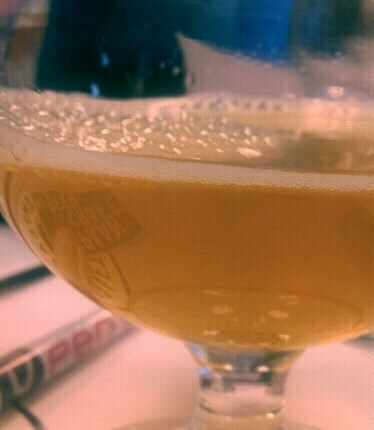 They labour over bottle openers as they uncork bottles of Brettalicious. Sour lime, mint, gooseberry and grapefruit scents levitate above the beer, a colour somewhere close to gold dust. Hazy and full of promise. The taste, subtle, refreshing and shimmering bright. Sourness is there, but a relaxed sourness Floral. The aftertaste puckers the mouth. I forgot to photograph this one. Our next sample is from Maximus Brewery, a number named Saison 5. I'm feeling a little buzzed by this point, these delicious products lying comfortable on my breakfast beers. The requisite farmhouse taste is there but subdued, comforting and low in hop notes. It is the colour of the early stages of a sunset over East Hartford; my home, and a village I suddenly miss terribly. White Label from Brouwerij Emelisse appears at our table with an Imperial Russian stout and it's probably time to start living like a Tsar. Chocolate mated with whisk(e)y, or the former slammed into the latter, are the overpowering scents. Looking like an ancient biker jacket that has been liquidised, and tasting of smoky, bitter and ashen coffee, the black coffee of a hangover morning. There are torched caramel elements to the taste that suggest nothing less than an utterly evil Mars Bar. 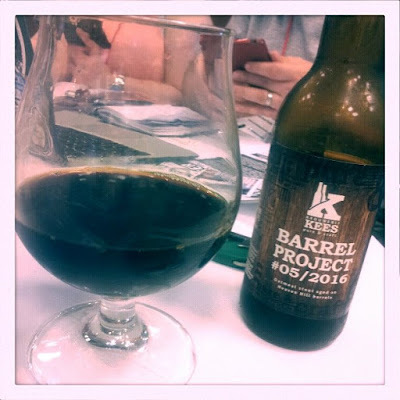 Brouweirij Kees Barrel Project #05/2016 arrives. It pours beautiful petroleum for a glass filled with cassock-black beer. They leave the bottle. It's an oatmeal stout, lightly spicy and thick on the tongue. They leave the bottle. It's 10% ABV. This is the beginning of the descent, as I dive into a pool of smoky black milk. It's time to revisit the work of Oedipus Brewery, whose Thai Thai Saison I experienced last night. This beer is called Swingers. a Gose beer (brewed with salt and way nicer than it sounds), soured with lactobacillus (what's up, chemistry nerds) and instantly both thirst and hunger inducing. Someone chopper out a Papa Johns to me right (Amster)damn now. It hits the senses hard with bitter and bright premium flavours of gummi. Imagine craft gummi and you'e nailed it. 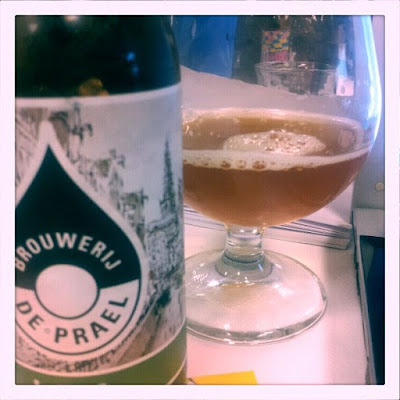 Brouwerij De Prael are another team that leave us the bottle. Their IPA lands on our table. It pours a filthily gorgeous conglomerate of dirty brass and peach in the shadows. The scent is grapefruit. It smells like the few months when, aged 19, I read a book about the Rat Pack and thought I was Frank Sinatra. There is wonderful grapefruit bitterness that crackles like lighting through the mouth. Number nine arrives! 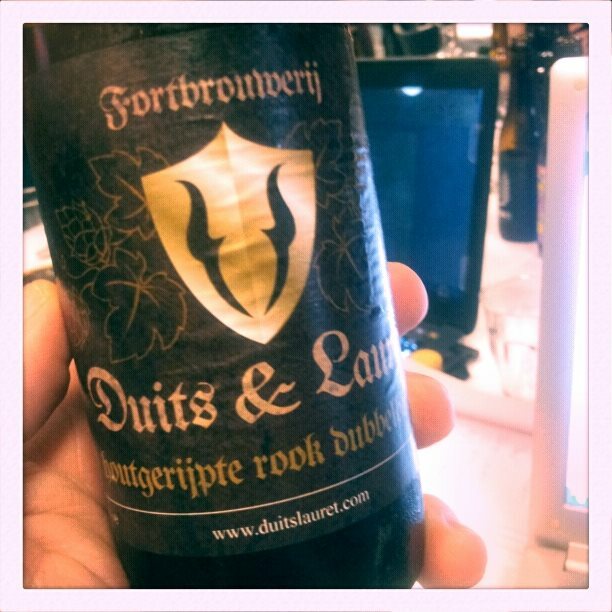 With a smoked porter called Koud Vuir (cold fire, how metal is that?) Bax Bier make their entrance. Tamer than the unhinged rauchbiers from Germany, it's sessionable if you can get away with the smoky flavour (and this reporter can, and so can you if you dig smoked meat of any kind, I GUARANTEE IT. Duits and Laurent Brewery, hailing from Utrecht, throw the final ball of the match with a wood-aged doppelbock, liquid bread for fasting monks as legend has it. It hits at 7.5%, the taste of the wood obvious, cozy, warming and wonderfully meaty. This medium rare beer has the aspect of well-loved leather, wingbacked and patrician. It really does feel like a meal in a glass, which is pretty good for this thirsty and now quite lit beer scrivener who hasn't eaten since he forced half a sandwich into himself at breakfast. And with that, the beery speed date is over. A bus leaves at 17:45 to take us on a suicide mission to Jopen Brewery in Haarlem. Those of us who are about to drink (even more) salute you.